Former main opposition Liberty Korea Party leader Hong Joon-pyo on Monday pulled out of the bid for the party’s leadership, in a surprise move less than two weeks after entering the race. “It is regretful that I cannot stay until the end,” firebrand conservative politician Hong said in a statement sent to party members. Hong’s withdrawal is widely viewed as a reaction to imprisoned former President Park Geun-hye having a significant impact on the convention. Last week, a rare TV interview by Park’s confidant and lawyer Yoo Young-ha conveyed Park’s disappointment at former Prime Minister Hwang Kyo-ahn, who is running for the party’s leadership. Park remains influential in the party’s stronghold of the Gyeongsang provinces, a region vital to winning the party’s leadership. 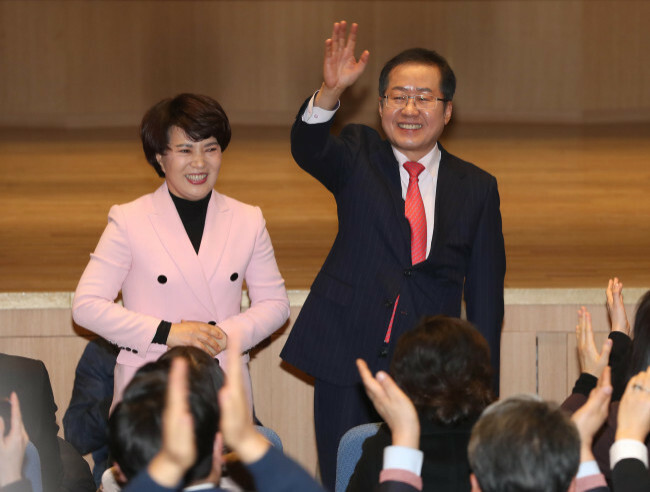 Meanwhile, the Liberty Korea Party confirmed the convention will be held Feb. 27 as scheduled, though six of eight candidates have called for it to be postponed.